The Muskrat Mashers are having a “Learn to Make Beer” open to the public event this Thursday, February 9, from 6pm to 9pm at Harbor Inn & Ale. The event hopes to encourage new people to brew by having educational displays, a Q & A session with experienced homebrewers plus one lucky person will be walking away with a brand new starter kit from Adventures in Homebrewing! Click here for the facebook page. Here is more information about this event from the Muskrat Mashers website. If you’ve ever kicked around trying to make your own beer, we invite you to stop out to our February gathering. Our plan is to have some equipment set up, some fliers to hand out, and members of the club will be on hand to answer any questions you might have about getting started brewing. Also if you haven’t checked out Harbor Inn and Ale, they have a fantastic lineup of Michigan made beers! The Muskrat Mashers is an informal homebrew club that meets once a month to discuss one thing: How to make beer. The group isn’t made up of a bunch of chemists or master brewers, we’re just regular people, that get together to enjoy quality beer and talk about how we made it. The club has a mix of people from newbies to seasoned brewers. We love helping new people get started with brewing, because somewhere along the way, someone experienced helped us get started. Public Welcome! Ever wonder how beer was made? Ever consider making it yourself? Stop out for an evening dedicated to how to brew your own beer. Members of the local homebrew club Muskrat Mashers will be on hand to discuss the basics of making your own beer from buying equipment and choosing a recipe to bottling or kegging the final product. • Already brewing? Meet other local homebrewers! 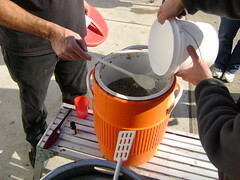 Our homebrew club, Muskrat Mashers, is holding a membership drive/homebrewing demo this Thursday, February 10. Sarah wrote a press release that does a great job of describing the event so I will let her take it from here. The Muskrat Mashers will host an informational session on home brewing on Thursday, Feb. 10 from 6-9 p.m. at Harbor Inn and Ale in Monroe, Michigan. Have you ever wondered how beer was made? Have you ever considered making it yourself? Would you like to meet and share ideas and experiences with other home brewers? If you answered yes to these questions, then stop out for an evening dedicated to home brewing. Members of the Muskrat Mashers homebrew club in Monroe will be on hand to discuss the basics of home brewing from buying equipment and choosing a recipe to bottling or kegging the final product. This gathering will feature equipment and ingredient displays as well as discussions and handouts on how to begin home brewing. It will also be an excellent opportunity to meet and network with other local home brewers. This event is free and open to the public. Harbor Inn and Ale is located at 13993 Laplaisance Road in Monroe, Michigan. For more information about the Muskrat Mashers go to http://muskratmashers.com/. Join Monroe, MI local homebrewing club Muskrat Mashers as they brew several batches of beer in the parking lot of Harbor Inn & Ale, located on Laplaisance Road in Monroe, MI. Handouts will be available for anyone interested in learning the hobby, as well as open invitations to future Muskrat Mashers meetings. Local brewers are welcome to join us – please contact us at the email below for info. Brewing kicks off at 10AM and will last most of the day. Stay for lunch @ Harbor Inn & Ale and enjoy one of their many Michigan made craft beers on tap. And while we’re on the subject, if you haven’t heard, Monroe, MI has a homebrew club! We meet the 2nd Thursday of every month. This months meeting is September 10th @ Harbor Inn & Ale from 6-8 p.m.. The topic of discussion will be: Growing, harvesting hops and how to use them in your homebrew. See: MuskratMashers.com for more info. Details: We don’t officially have a “club” formed just yet. This meeting will be the first, to see if there’s actually any interest in forming a homebrew club in Monroe. If we get enough people interested, we’ll make these monthly meetings and register our group with the American Homebrewers Association. Monthly meetings might consist of discussions on various topics, such as, a beer style; how it’s made, what hops to use, etc. Another topic might be cleaning techniques. Another, might be an actual brew session. Our first meeting, we’ll probably discuss some very basics on making beer and what it takes to get into the hobby. Who should attend? Anyone interested in the hobby! The one thing I’ve found about the homebrewing community: everyone is very friendly and helpful. Homebrew club meetings are for novices to experts. *Edit: Because we are having the first meeting at a restaurant, please do NOT bring any homebrew. Harbor Inn & Ale has a nice variety of Michigan Beer on tap.